Does the Big Bang Eliminate the Need of a Creator or Is it Evidence of a Transcendent Creator? Although many Christians have traditionally rejected Big Bang cosmology, today many Christian theologians and apologists maintain that when properly understood, the Big Bang actually points to the existence of a transcendent Creator, like the God described in the Bible. Why Have So Many Christians Traditionally Rejected Big Bang Cosmology? 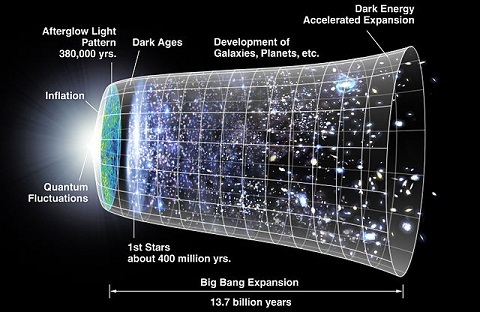 Christians who reject Big Bang cosmology generally do so for one or both of the following two reasons: 1) They believe the Big Bang theory necessarily eliminates the need for a Creator thereby eliminating the need for God and/or 2) They believe the Big Bang theory contradicts the creation account set forth in Genesis 1:1 – 2:3. There is no question that vigorous debate exists among Christians over how the creation account in Genesis 1 & 2 is to be interpreted. Although there are several competing views, the proponents of the differing biblical creation views basically fall into one of two major camps: Young Earth Creationists (YECs) or Old Earth Creationists (OECs). Generally, YECs believe a correct interpretation of Genesis requires the view that God created the world in six consecutive 24 hour days about 6,000 – 10,000 years ago. OECs generally believe the biblical creation account permits a creation date that is consistent with the universe coming into existence about 13-14 billion years ago and the Earth forming about 4-5 billion years ago, as proposed by secular scientists. Although the great majority of YECs steadfastly reject Big Bang cosmology, many Christian theologians and apologists contend Big Bang cosmology actually provides evidence of the existence of a transcendent cause of the universe, like the transcendent Creator described in the Bible. Many OECs also point out that Big Bang cosmology presents significant challenges to the validity of any religion that claims God and the universe are one (i.e., religions with pantheistic elements) or which describe God as being confined to the universe, creating from within the universe or creating within time. Regardless of a Christian’s particular view of the correct interpretation of Genesis 1 and the age of the Earth, because Big Bang cosmology is taught in every secular High School and College, all Christians should at least have a general understanding of what the theory says/doesn’t say and why at least some Christian apologists maintain Big Bang cosmology actually supports a biblical worldview. What is the Big Bang — A Chaotic Explosion Out of Nothing or Evidence of Transcendent Design? As explained by Christian astronomer and astrophysicist Hugh Ross, even secular scientists do not propose the Big Bang was a disordered or chaotic “bang”, as its name may imply. In fact, Ross contends that nothing is further from the truth. Rather, as explained by Ross, the Big Bang was “an immensely powerful yet carefully planned and controlled burst of creation – a sudden release of power from which the universe unfurled in an exquisitely controlled expansion. In an instant, time, space, matter and energy, along with the physical laws governing them all, came into existence from a source beyond the cosmos.” Even the popular atheist, Richard Dawkins, admits he is intrigued as to how the universe came into existence with the laws of nature already written into it. [See, Alister McGrath, Ravi Zacharias International Ministries, Foundations of Apologetics, “The Existence of God” (2007), aired on NRB, 2/24/10] There is no dispute among scientists that the Big Bang was not a chaotic explosion. Rather, as explained by Hugh Ross, the expansion of the universe demonstrated exquisite balance, extreme fine-tuning, incredible precision and complex design. To illustrate the degree of exquisite fine-tuning involved in Big Bang cosmology, Hugh Ross points to the two parameters which govern how fast the universe expands: 1) the mass density of the universe and 2) the space-energy density of the universe. As explained by Ross, both parameters had to be exquisitely fine-tuned in order for life to exist anywhere in the universe. The mass density of the universe had to be finely tuned to better than one part in 1060 (i.e., 1 part out of 1,000,000,000,000,000,000,000,000,000,000,000,000,000, 000,000,000,000,000,000,000). The space-energy density of the universe had to be fine-tuned to better than one part in 10120, i.e., a 1 followed by 120 zeros. If the universe did not expand in accordance with both of these precisely finely-tuned characteristics, no physical life would be possible anywhere in the universe (more>>). There simply is no dispute, even among secular scientists, that the universe appears to be exquisitely fine-tuned and designed to support life (more>>). Accordingly, all creationists (YECs and OECs) can safely put to rest any concern that Big Bang cosmology eliminates the necessity of a Creator by proposing the universe came into existence by some kind of chaotic “bang” as it’s name implies. If it is proposed that the Big Bang singularity (the compaction of all matter and energy that presently exists) existed in a state of organization which suddenly “exploded” and is now moving to a state of disorganization or equilibrium, then one must ask how the singularity got organized in the first place. [See, R.C. Sproul, “Defending Your Faith”, CD No. 3] This is a significant question because the Second Law of Thermodynamics establishes that the universe, and everything in the universe, is moving from order to disorder (not disorder to order) So, if everything is moving to disorder, how did everything that now exists get ordered to begin with? No compelling explanation has been offered as to how the singularity could have gotten into such a highly organized state from a naturalistic point of view. Geoffrey Burbidge (an atheist astronomer from the University of California at San Diego) was so philosophically opposed to a Big Bang model of the universe that when his fellow astronomers began adopting the model, he accused them of “rushing off join ‘the First Church of Christ of the Big Bang.’” [Hugh Ross, Creator and the Cosmos, 3rd Ed., pg. 32 (2001)] As noted by Christian astrophysicist and apologist, Hugh Ross, Burbidge’s response to the adoption of Big Bang cosmology demonstrates that even atheist scientists recognize that not only does Big Bang cosmology imply the existence of God, but it specifically implies the existence of a transcendent Creator like the Creator described in the Bible. It also challenges the veracity of all pantheistic views as well as religions which describes God as being confined to the universe, creating from within the universe or creating within time. Regardless of a Christian’s particular view on the correct interpretation of Genesis creation account and the age of the Earth, it seems prudent for all Christians to be aware of the philosophical and theological implications of Big Bang cosmology which point to the existence of a transcendent cause of the universe, like the transcendent Creator described in the Bible. Facts and Faith makes every effort to use media which is free for use or in the public domain. If you suspect a copyright violation on any factsandfaith.com publication, please notify us here ASAP.